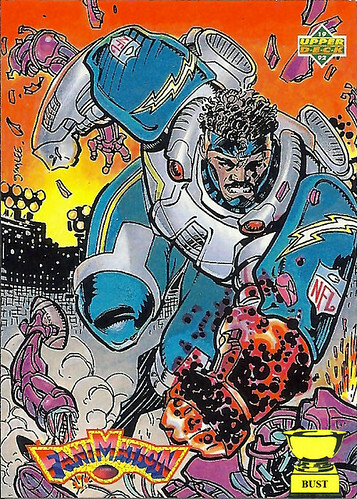 Name: Junior Seau, aka "The Warrior"
Real nice, Upper Deck: So, among the many ridiculous premises of the Upper Deck Fanimation cards was the notion that these stars were battling some sort of evil droids in various sports. Riiight. The thing is, that sure looks like blood and gore not oil and gears on Seau's fist. And are those wires spilling out of that severed arm in the lower left, or are they tendons and skin? Great, Upper Deck, you've decided to give the kids nightmares about their favorite athletes literally ripping their opponents limb from limb, soaking in the carnage. Oh, and another thing: Really, "The Warrior?" You already used that one for Dikembe Mutombo. Look, just because these guys' family histories extend beyond the borders of the U.S., doesn't mean it's OK to just nickname them all "The Warrior." One thing's for sure: No one would ever call whoever drew this atrocity "The Artist." Blech. I think that's a red-hot, smoldering stiff-arm.